#MakeMeRead has officially started in my timezone (well, it started an hour and half ago but I was asleep) and so I thought it was time I shared the results of my poll. So are you ready? There you go! 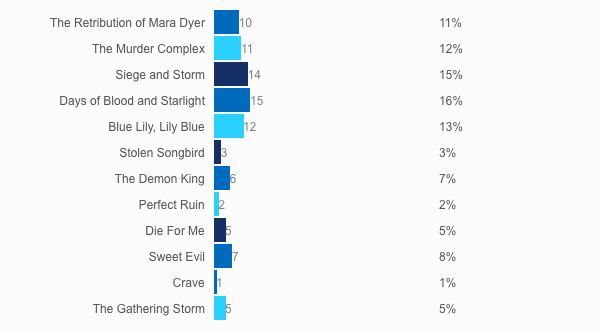 My first read will be Days of Blood and Starlight which was popular from the very beginning, then Siege and Storm, followed by Blue Lily, Lily Blue (!!) and The Murder Complex. If I manage to get through all of those, then I'll pick up The Retribution of Mara Dyer, Sweet Evil and then, possibly, The Demon King. I honestly don't know how many books I'll get through this week, but I would like to take a serious chunk out of these. On that note, I'm off to start Days of Blood and Starlight!